I'm starting up with LaTeX today in order to be able to produce better-looking PDFs for university assignments. I'm working through a list of small exercises, handed out by a volunteer professor, and a certain one has stalled me a bit. Obviously I still have to do something for the letter spacing, condense them together. I've gone through at least 6 similar topics on tex.stackexchange and I haven't been able to solve it using the already proposed solutions. Any help related to my question or with any problems in my code (maybe I've written redundant lines) would be greatly appreciated. I'm using TeXStudio and MiKTeX. This is homework, so I'll only give a hint: no \fontsize command is used, just standard documented commands. Also, as you already figured, a more sensible approach is to use the built-in size commands. 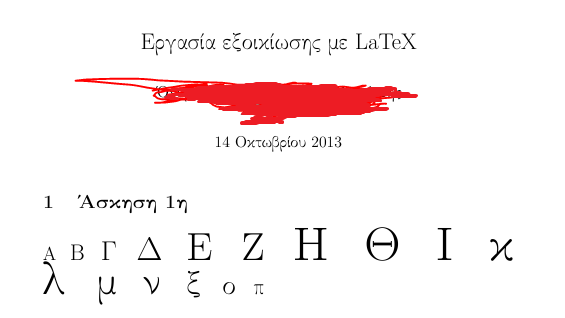 How to change the fontsize of the Greek letters in formula? How can we choose different sizes for letters and numbers?